570 Pounds received as a result of the Support Adoption for Pets Santa Paws Fundraising event. 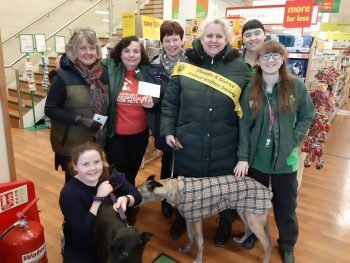 Following the Support Adoption for Pets Santa Paws Fundraising event, Amanda, Lesley, Lily and Marrilyn together with their four legged supporters Muffin and Darcy, were delighted to be presented with a cheque for £570 at the Pets at Home Uttoxeter Store recently. We are extremely grateful for the continued support the team at Pets at Home Uttoxeter Store and Support Adoption for Pets continue to give Cheadle Animal Welfare. Thank you also to all the customers who donated during the campaign which ran during December and to all those who continue to leave dog and cat food in the donation bins located at the Pets at Home Uttoxeter Store. We and the Waifs and Strays are as always extremely grateful.